We are pleased to provide exceptional line rental, telephone call and broadband deals to all customers, both big and small through our partnership with Global4 Communications Ltd.
Our telephone packages are incredibly flexible and there is no long term contract to sign. All contracts are on rolling 30 day terms and there are no hidden charges or set up fees. The only company to show you’re inbound and outbound call data on-line daily. We have similarly attractive rates for international destinations, just look at some of the rates below. Please call to ask the costs for your specific destinations. All our international calls have no connection fee and the rates are the same for throughout the day & night, without any higher peak rates, and it costs the same to call a landline or a mobile. Calls and lines can be transferred to our BT wholesale account in 12 days without cost or disruption. For those looking for new hardware, we have arranged for NEC to provide a suite of tailor made telecom solutions. Disclaimer * : All copyrights, trademarks and tradenames are acknowledged. 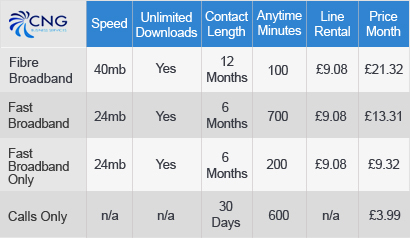 Rates used in comparison: BT Business Phone Line (2 year contract), BT mobile rates are based on Daytime rates only. 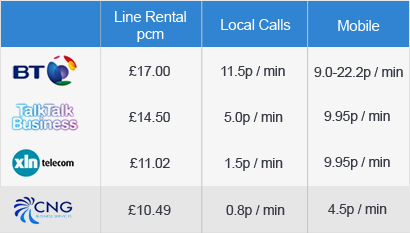 TalkTalk Business – Business Line, XLN line rental comprises £5.99 for 6 months and £12.69 thereafter, averaged over a total contact of 24 months. Please refer to our full price list for details of call charges. Information is for guidance only and does not constitute any contractual representation or warranty. Liability for errors, omissions or consequential loss is expressly disclaimed. Prices shown exclude VAT, discounts, special offers, promotions, charges etc. . Sourced from respective websites and/or telephone verification on 22/05/2013 and may vary at any time without notice. Disclaimer ** : All copyrights, trademarks and tradenames are acknowledged. Rates used in comparison: Information is for guidance only and does not constitute any contractual representation or warranty. Liability for errors, omissions or consequential loss is expressly disclaimed. Prices shown exclude discounts, special offers, promotions, charges etc. 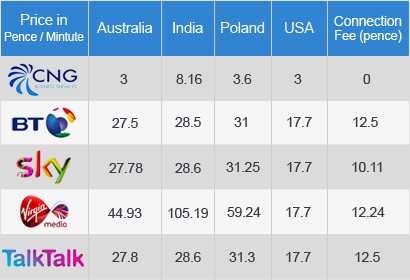 Figures from published information on competitors’ websites as at May 2011 (E&OE), as provided by HomeTelecom.